On Friday September 29, BridgePoint Effect ran a special event in Ottawa that introduced our course Risking and Learning from Failure in Innovation with leaders from the private, federal government and non-profit sectors. They were brave souls willing to engage in reflective thinking on how to give innovation and failure a makeover in their organizations. In this article, I highlight some surprising takeaways from the event. Most organizations are focused on best practices. Doing so takes a willingness to engage in concrete experimentation, a tolerance for ambiguity, complexity and risk taking, and the ability to engage in reflective thinking. In our quest to drive innovation, we forget that all roads to success involve “miss-takes” and failures. While we’re eager to share outcomes framed as success, we hesitate to speak about the miss-takes and failure that are so characteristic of the innovation process. Taking time to reflect on what we’re learning on our innovation journey gives us a reality check on the progress we’re making and the opportunities for improving our efforts. Neglecting to take this time to learn is counterproductive and keeps the necessary process of experimentation, reflection and feedback in innovation from unfolding. In a closing activity, we asked participants to reflect on what they liked, learned, and found surprising about what they had learned during the course. Here is a sampling of what we heard. People told us they really appreciated the opportunity to explore the issues around risking and learning from failure in innovation. They shared that the environment we created in the workshop made them feel safe and comfortable to engage in creative and productive dialogue. Many people shared that “I realized I engaged in risk taking more than I give myself credit for.” While it wasn’t always roses and sunshine, in the end, the rewards of taking a risk in innovation outweighed whatever bad things they thought could happen by taking the risk. The tools and techniques we introduced to develop a mindset for risk taking—including reflective thinking and creating safety around risk taking—were practical and appreciated. THINK: what if everything goes right? Ask / assess with my team: what happens if we don’t take the risk to move forward? 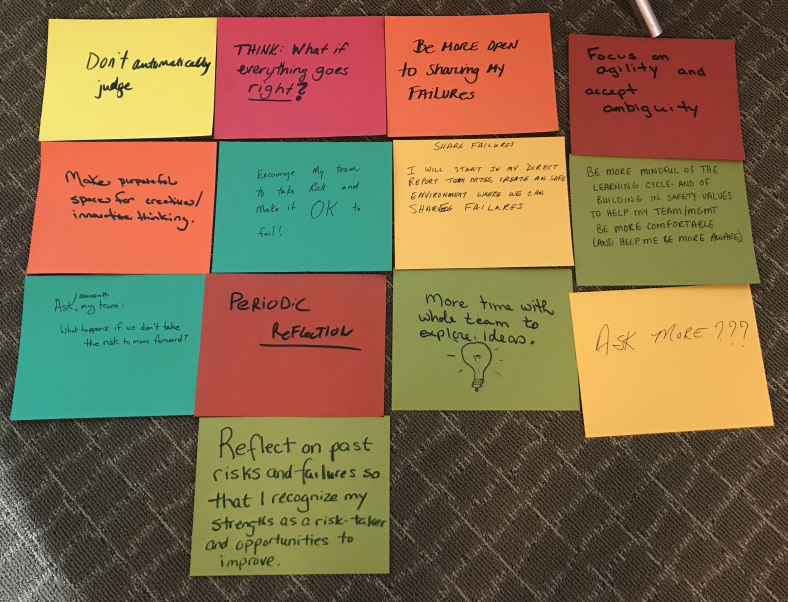 In the spirit of experimentation—taking risks and learning from failure—at the end of the course we asked participants what we could do to improve on their experience of the course. And I am so grateful that we did. One senior leader came to me afterwards to discuss her challenges around risk mitigation. And her comments complimented a break-time conversation I had with a Director in an Information Technology organization and one in Human Resources. Most organizations have a best practice around risks, whether these are tied to an innovation effort or not. The practice is typically project-related and works to first make a list of risks, then to make a corresponding list of how the risks will be mitigated. Interestingly, two things appear to be going on here that are counterproductive to truly understanding and dealing with the risks. The practice of risk identification and mitigation appears to be nothing short of a “check boxing” effort – “Risks? Yes, we have identified them (check). Mitigation Plan? Yes, we’ve identified ways to mitigate them (check)”. The risks and mitigating options typically are the more obvious ones and the way they’re communicated is through a short meeting where everyone nods their head saying, “Yep, those seem to be reasonable risks.” There’s little to no dialogue around the risks, and the unspoken expectation is, “…and we just don’t want to go there, so let’s move on”. The challenge arises when the inevitable does happen and a risk raises its head—or worse, an unanticipated risk surfaces. We need to change the conversation we’re having around risks and failures in innovation. The results of my conversations with participants at our event show a thirst for creative thinking tools to change the conversation around risks and their mitigation. The good news is, there’s a number of ready made thinking tools in the toolkit we share in our Breakthrough Thinking and Breakthrough Thinking for Leaders courses. These tools can be used by anyone to lead any small group of stakeholders and decision-makers through a more creative, productive and realistic conversation about the risks the organization is facing and the ways they will deal with them. And, they will help to identify success factors and where the limits of tolerance lay. So, what is BridgePoint Effect’s commitment to changing the conversation that organizations have around risking and learning from failure? Usually we teach the Risking and Learning from Failure in Innovation course to intact teams, so we’re going to develop an optional module that focuses on Risk Mitigation. This module will introduce a different practice for identifying risks and engaging stakeholders in creative thinking around how to mitigate and respond to them. If you’d like to know more about how we can help your organization change the conversation you’re having about risking and learning from failure in innovation, reach out. I’d be delighted to speak with you.